Last Thursday, I paid a visit to the Jenni and Kyle Preserve, a Dane County Park with a positive mission. Specially designed for people with disabilities, the park is fully accessible to ensure a fun outdoor experience for all. The Jenni and Kyle Preserve was originally created from a donation from Harvey and Patricia Wilmeth in 1989. The park is a memorial to their grandchildren Jenni and Kyle who both suffered from a rare degenerative neurological disease that sadly took their lives at the age of four. The family of Jenni and Kyle continues to donate to the Dane County Parks division for a variety of projects that have improved access to the outdoors for those with special needs. 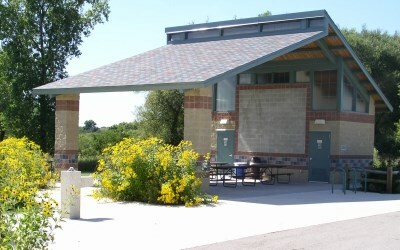 Located near Fitchburg, the park is part of the Capital Springs Recreation Area. The Madison Area Rehabilitation Center (MARC), which provides services for people with disabilities of all ages, is right next to the park to allow easy access. Featured in the park are two fishing ponds with eight accessible fishing stations. Most of the park’s 161 acres of land are covered in shallow wetlands with a combination of paved and natural surface hiking trails. There are also two wheelchair-accessible swings and a picnic shelter. A mural was added to the wall of the shelter in 2011. The project was led by VSA Wisconsin, a state organization that uses art to empower people with disabilities, in a partnership with MARC-South, Walbridge School, Dane County Cultural Affairs Commission, and Dane County Parks. The mural is a mosaic made up of more than 15,000 tiles. Titled “Seasonal Inspirations,” the mosaic depicts the four seasons with things such as snowmen, dragonflies, fireworks, and pumpkins. On the edges are smaller images of sunrise and sunset. Seventy talented people with disabilities worked 80 hours in total to put together the piece. For the past 13 years Dane County Parks has partnered with a variety of organizations including the Madison Fishing Expo, Dane County Conservation League, Wisconsin Smallmouth Alliance and Friends of Capital Springs Recreation Area to host the Annual Jenni and Kyle Fishing Day for individuals with disabilities. The event provides fishing equipment free of charge and a cookout at the end. My time at the Jenni and Kyle Preserve was eye-opening. I was in awe of the thoughtful planning that made it accessible to all. It felt like a place where everyone could connect with the outdoors, and enjoy all the opportunities that nature gives us. Jenni and Kyle were honored in the best way possible.